We’re just going to come right out and say it – we have decided to put WEEKENDER on hold. After 15 years of fantastic routes and communities, we want to try something a little different. We’ve collected a lot of feedback over those years, and we want to see how we can tweak this event to incorporate some of your great ideas and make a new and improved WEEKENDER just for you. We realize that a lot of people love and look forward to the event every year, we do too, and because of that we want to do it even better. So, we’re hitting the pause button. We’re taking the year to re-imagine the event; determined to bring it back as something so fun you’ll drive your friends and families nuts for talking so much about it. And while we’re plotting out the course for the future of WEEKENDER, we’ll be honing in on making Joyride, Classic and GRAVEL as amazing as they can possibly be! 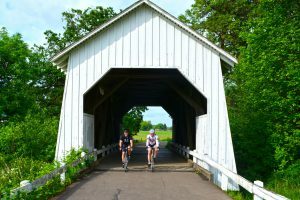 Even if you’re a ride-or-die WEEKENDER fan, you can still find the camaraderie, amazing routes and all-around awesome time on any of our other events. So if you haven’t considered riding a Classic before, maybe this is your year. Or if you’re ready for a strictly dude-free riding experience with your fellow females, come on out to Joyride. Or, if going off the beaten path sounds like a hoot, then perhaps GRAVEL is in your future. In any case, keep on pedaling, and we’re looking forward to riding with you in 2019! So disappointed about weekender pause. I’ve done this ride for last decade and brought along many friends who have grown to love (and prefer) this event. I enjoyed seeing the kids learn in bike camp, the active seniors that we aspire to be later in life as well as all the groups that made the weekender their annual event together. We sincerely hope – and trust- this is truly a pause as we won’t be doing any CO events this year without the weekender. Joyride is fun but precarious weather so early in season, gravel a no-go and weeklong expensive and too much time in saddle. The weekender was always the perfect combo of riding and friend time. Please do bring it back – and please don’t break all the good aspects we’ve loved. 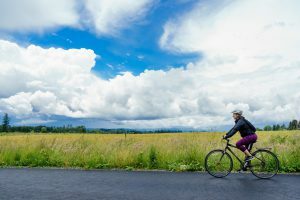 WEEKENDER has been a Cycle Oregon staple since 2004, hosting the event for tens of thousands of cyclists over the years all throughout the Willamette Valley. Offering daily routes for every level of cyclist, it’s been home to every age group and ability, providing activities and amenities for both young and old, and it’s important to us to continue to offer an event for such a broad audience. So very disappointed at this news. It’s our favorite ride each summer – we plan our summer trips around it. Linfield, OSU, Willamette, WOU and even U of O provided a weekend of riding and fun with our riding buds……say it ain’t so! Disappointed to see no weekend ride this year. I understand if attendance is going down that changes should be considered. But you can’t study those and keep the ride active? Weekend event was the best of all the CO rides; great introduction for new riders, family friendly and more affordable than the week ride. You drop the ride this year and people will find something else to do and may not return next year if you bring it back. Good luck with your other events. Oh that is really too bad. We just logged on to check the date of the kickoff party. We build our summer around the Weekender. It’s such a great combination of the Cycle Oregon experience and a ride you can do without monster training. We started riding in 2012 and have 5 weekenders but only three Cycle Oregon’s. They are just too hard! We love, love, love these organized rides and Cycle Oregon is the best! We’ve done the Oregon bike ride, Ride Idaho, RAGBRAI and GOBA week long rides since 2012 as well. Cycle Oregon is still our favorite. Sorry it’s not a sustainable business model for Cycle Oregon. We will miss it. So sad to see the Weekender has been postponed this year! It’s a really great family event that I’ve enjoyed with my sister and her kids. I noticed that last year the Weekender was scheduled the exact same weekend as another big cycling event in the area, the Seattle to Portland (STP) ride. I have to wonder if attendance might have been better if the dates hadn’t coincided? I will really MISS the weekender!! My daughters are very disappointed. We drive from Utah for this and then spend the week on the coast. They love the bike camps and just being back in Oregon. Looking forward to a “new and improved” version next year!